(Moscow News – themoscownews.com – Nathan Gray – December 5, 2013) While freedom of movement for Russian citizens is enshrined in the Constitution, practical social and economic factors often impede its full implementation. The development of regional air travel, abetted by a series of state subsidy programs and last month’s launch of Aurora, the Far Eastern subsidiary of national carrier Aeroflot, is one point in the government strategy to overcome this challenge. As the government and airlines are each seeking to develop a competitive environment, a state monopoly on the national rail system remains firmly in place through Russian Railways, or RZhD. In some locations, monopoly operations and subsidies in rail transportation are to be expected and even necessary, Andrei Shenk, an analyst at Investcafe, told The Moscow News. In this atmosphere, the subsidies directed at both industries are necessary to guarantee service for residents of regions where the prospects for profitability are low. In general, however, competition in both industries – in regions where demand is high – is a better way to ensure efficient pricing, Shenk said. He reiterated, however, that some regions require subsidization of airlines and railways, such as the Far North or anywhere the passenger base is too low to sustain profitability. The competitiveness of rail in the face of airlines has been growing due to the popularity of RZhD’s Sapsan express service, connecting Moscow with St. Petersburg and Nizhny Novgorod. A zero-sum environment is absent, however, at least on the St. Petersburg rail and air routes, according to a report by the air transportation news portal AviaTransportnoye Obozreniye. 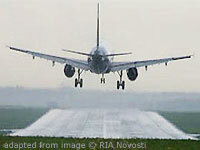 After the launch of the Sapsan to St. Petersburg in December 2009, passenger loads for both industries increased. Currently, ATO reported, both are approximately equal. While capacity limits on trains could have an effect, especially since the Sapsan does not have dedicated lines along the whole of its routes, even hourly trains could run with minimal interference, said Alexander Kazbegi, an analyst at Renaissance Capital. One of the key factors in their operations is the ability to reach their top speed, he added. High-speed rail, which is under development between Moscow and Kazan – a project announced in June by President Vladimir Putin at the St. Petersburg Economic Forum – is looking to build on the foundations of the Sapsan, but faces several challenges. One is the inherent long-term nature of the investment, Investcafe’s Shenk said. The St. Petersburg Sapsan has benefited from such a base, Shenk said, adding that while Kazan may offer similar turnover and profitability, neither is guaranteed. “To take, for example, the Moscow-Kazan route, the situation is very similar [to St. Petersburg], but there are already worse prognoses for the passenger base, and a lower price will have to be put on the tickets,” he said. The threshold for competitiveness between air and rail – beyond which air should dominate – is reached at around 800 kilometers, Kazbegi said, the distance of the proposed Kazan line. Another feature attracting passengers, however, is the development of train stations and airports. In this regard, airlines may have an upper hand, possibly through more diverse ownership than the train stations under the management of RZhD. “Clearly there is a very different development pattern there,” Kazbegi said. State operation of train stations does not rule out private participation in their redevelopment, however. In February, restaurant operator and franchiser Rosinter signed an agreement to develop food outlets at five stations in Moscow. For Kazbegi, one of the needs for private investment lies in making stations more attractive for passengers.